The 1930-C Single-Channel and 2930-C Dual-Channel Optical Power Meters deliver affordable high-performance for Scientific R&D and Telecom/Datacom laser power measurement applications. 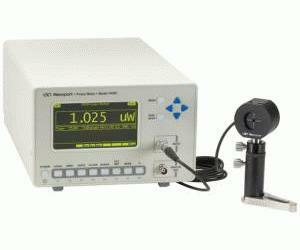 Used as a bench-top test station or integrated into an automated measurement system, the 1930-C/2930-C power meters work in conjunction with Newport free-space detectors to provide flexibility for all laser power measurements. Easy-to-install detector adaptors accept industry-standard fiber optic connectors, yielding high-accuracy power measurements. Additionally, low-noise detectors and seven gain ranges enable continuous power measurements in the range of tens-of femto-W to 2.5 W.
The 1930-C/2930-C power meters are compatible with all Newport 918/818 free-space Germanium (Ge), Silicon (SI) and Indium Gallium Arsenide (InGaAs) detectors to cover a spectral range from 190nm to 1800nm and satisfy most optical power measurement requirements. The front panel enables easy connection of Newport detectors and supports amplified detector analog output to an oscilloscope or voltmeter for up to 100kHz. Measurements can be displayed in W, A, dBm, dB or relative units, either directly or as relative ratio measurements from present or stored values. Statistical capabilities include the computation of Min, Max, Max-Min, Mean and Standard Deviation. Additional features such as digital and analog filtering, and data storage of up to 1,000 readings per channel are also offered. In R&D, QA/QC, and manufacturing environments, the 1930-C/2930-C power meters enable users to benefit from high correlation between multiple locations at a price-to-performance ratio second to none. Image shown is of single-channel 1930-C.